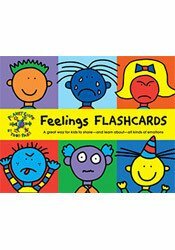 Todd Parr makes understanding feelings fun with these 20 sturdy flash cards featuring 40 different emotions. Each card shows two opposite feelings, one on each side, rendered in words and lively pictures. Kids will learn what it means to feel silly and serious, calm and nervous, brave and scared, and more. Todd Parr, is the author and illustrator of more than 40 books for children, including the bestseller, The I Love You Book, and The Thankful Book. His books are available in over fifteen languages throughout the world. He is the co-creator of the popular children’s television show ToddWorld as well as short films for Sesame Street. Todd has partnered with Target, Hilton, TOMY, Stouffer’s and several companies and organizations to help people and animals. Todd’s books have won several awards and his TV show, ToddWorld, was nominated for three Daytime Emmy® Awards.